As social media continues to prevail as the preferred form of advertising for companies of all sizes, many business owners find themselves wondering if it is still beneficial, or even necessary, to use email marketing as well. But even though social marketing and local search engine optimization has become the mainstream way to reach an audience and get word out about your product or service, you shouldn’t underestimate the power of email marketing campaigns just yet. Here are a few things you need to know about the advantages and drawbacks about two commonly effective forms of marketing for the digital age. Visibility- Facebook and Twitter, the two most popular social media networks, weigh in with 1 billion and 255 million active users, respectively. That a is a lot of potential customers that could be reached by your SMM campaign. However, people sometimes forget to take into account the prevalence of email. In 2013, the total number of email accounts worldwide was 3.9 billion, with that amount projected to be 4.9 billion by 2017. (Radicati) This means that there are three times more email accounts than there are Facebook and Twitter accounts combined! While it definitely pays to get your brand out there on social media, you could lose a lot of your audience if you don’t incorporate email marketing into your campaign. “Organic” Appeal- Though you may reach a broad audience of prospective clients through well-crafted email blasts, there is still something to be said for word-of-mouth marketing. These days, generating Facebook “likes” or adding followers on Twitter is the digital equivalent to word-of-mouth. Prospects are more likely to try a product or service from a brand that has a lot of devotees. Social media marketing helps new businesses to create a fan base and establish trust and recognition among consumers, perhaps more organically than a marketing campaign based solely on email advertisement. Audience Targeting- Most people who are on an email contact list have chosen to opt in to receive updates about the company’s products and services. This means your business has an actual list of people who are interested in your brand and what new items you have to offer. On the other hand, relying simply on “likes” and follows from your social media fans is considerably harder to keep track of, and though the Facebook and Twitter algorithms are now able to pinpoint ideal marketing prospects for your business based on previous products they have “liked” or companies they currently follow, this is still not a guarantee that your ad will draw their attention. 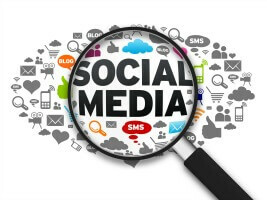 Bottom Line: Social Media Marketing is a wonderful tool for companies of all sizes. But don’t just focus on SMM for your marketing needs. Creating a little room in your budget for email marketing can help widen your scope when targeting potential customers and help you zero in on exactly who you are marketing your products and services to when you create new advertisements. Both social media and email are valid forms of marketing that are able to coexist peacefully and even feed off of one another when you are getting your small business off the ground.